Local Data Repository is a type of spreadsheet which contains data that can be used for test iterations in OpKey Web. While working with Test Case(s) in OpKey Web, now you can use your data from the Local data Repository for iterating the Test Case. You can either create Local Data Repository file or import data from an Excel sheet (.xlsx files only) as per your convenience. 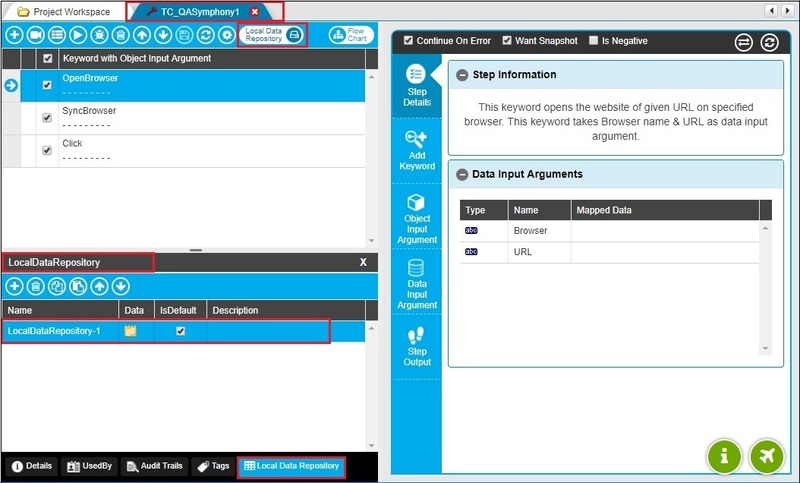 You can switch to the Local Data Repository mode to provide data driving values from your Local Data Repository. 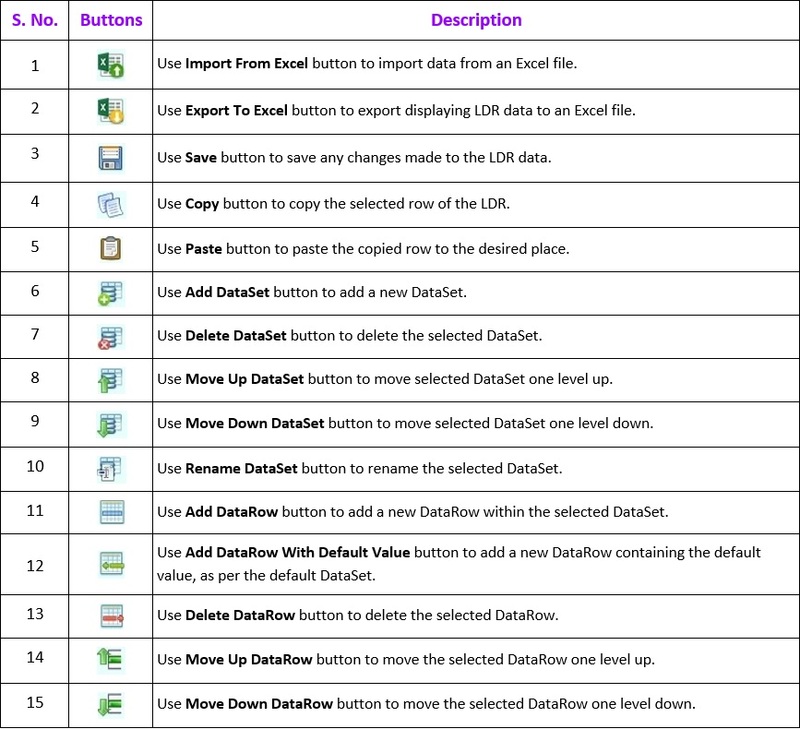 Local Data Repository provides you the flexibility to add and manage data by providing features to add Datasets, rows/columns, move rows or cells, Import/Export data from Excel, copy/paste the data and save it as well. The Data Repository consists of a spreadsheet which is divided into number of Datasets and Datasets into rows and columns. 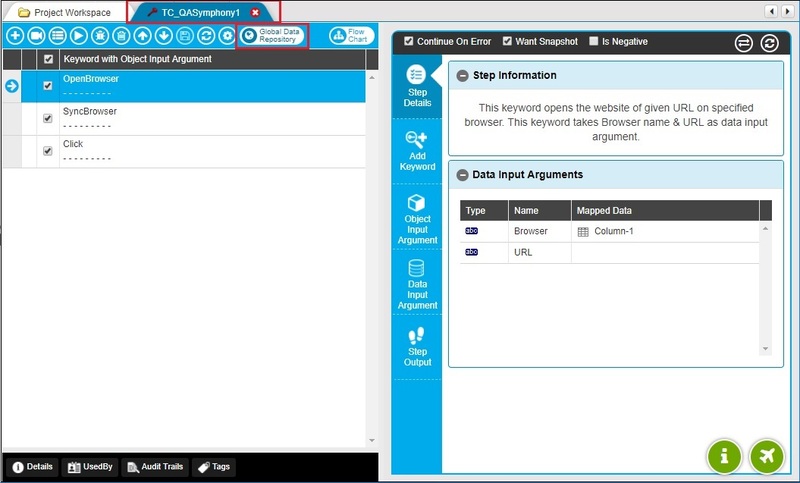 While working with Test Case in OpKey Web, you can provide data driving value either from Global Data Repository or from Local Data Repository. By default, Global Data Repository mode is selected which allows you to provide data from your Global Data Repository file. You can switch to the Local Data Repository mode to provide test iteration values from your Local Data Repository. Test data plays a significant role in Test Automation. You may come across many Test scenarios that need to be parameterized. Parameterizing the Test case allows you to run the same Test Case with variable inputs , therefore increasing the coverage from a single Test value to multiple Test values. Data in the Local Data Repository is used during subsequent run-sessions thus, you need to be careful while entering Data in the Data Repository. The iteration of the selected test step(s) will be perfomed only during it finds data from the respective DataRow of the DataSet. At a time, you can use either Local Data Repository or Global Data Repository for the Test iteration. The Local Data Repository stores all the Static value(s) and Global variable value(s) provided initially in the Test Step(s). A dataset in the Local Data Repository defines the number of iterations a step requires to go through. Number columns in the Local Data Repository are equal to the number of test steps in the Test Case. Rows & columns contain data values which are used for test iterations. Unlike Global Data Repository, Local Data Repository allows you to iterate desired test steps only, by using the data from the Local Data Repository. Local Data Repository may contain either a single or multiple Local Data Repository files. A Local Data Repository file may contain either a single or multiple Datasets which are divided into rows and columns. There may be either single or multiple rows within a Dataset. A dataset in Local Data Repository defines the number of iterations a step requires to go through. Number columns in the Local Data Repository are equal to the number of test steps in the Test Case. Unlike Global Data Repository, Local Data Repository allows you to iterate desired test steps only, by using the data from the Local Data Repository. 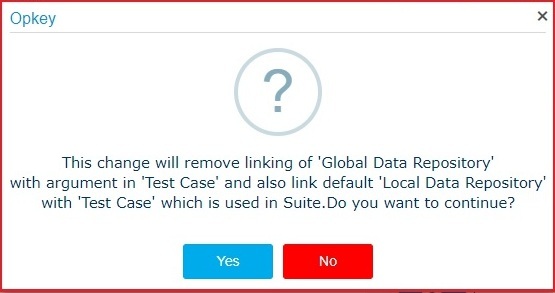 When you work with the Test Case, by default Global Data Repository mode is selected which allows you to provide data to iterate the Test Case. Click Yes to proceed with Local Data Repository. The Local Data Repository tab will be added in the dockable panel. Click on Add to add a new Local Data Repository file. Click on Local Data Repository icon to view the Local Data Repository file. By default, the Local Data Repository remains in read only mode. Click on Enable Editing to enable LDR editing. The number of columns in the Local Data Repository is equal to the number of Test Steps in the Test Case. The Local Data Repository stores all the Static value(s) and Global variable value(s) provided initially in the Test Step(s). You can edit the Static value(s) in the Local Data Repository by clicking on the desired cell. 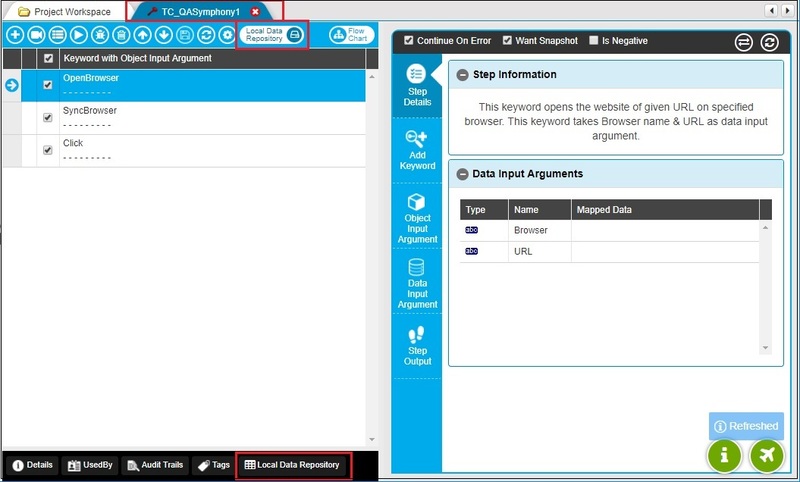 However, the data value(s) provided with the Global variables cannot be edited.